To celebrate the importance of the arts to health and wellbeing Ivan will perform in the downstairs cafe area in the Causeway Hospital. Ivan is the Ulster University International Musician in Residence. 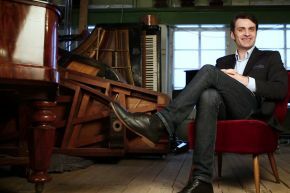 He is a Serbian-American trailblazing classical pianist and thanks to his personal charisma and unusual approach to repertoire, he has succeeded in creating a unique place in the classical music world. In addition to his solo recital tours and performing in a range of venues across the world including Carnegie Hall in New York. Ivan has written and presented video documentaries, co-produced in-depth radio programmes for Swiss Radio, and written articles for Gramophone, BBC Music Magazine, and other prestigious publications. Admission is free and everyone is welcome so come along and enjoy with us, this unique experience in the hospital.